With ever more bands hitting the scene, it’s becoming increasingly difficult to stand out as unique. While some people use this situation to claim that rock is dead, some instead choose to adopt disparate familiar elements to form a complete and different whole. Oceans of Slumber are definitely one of these bands. 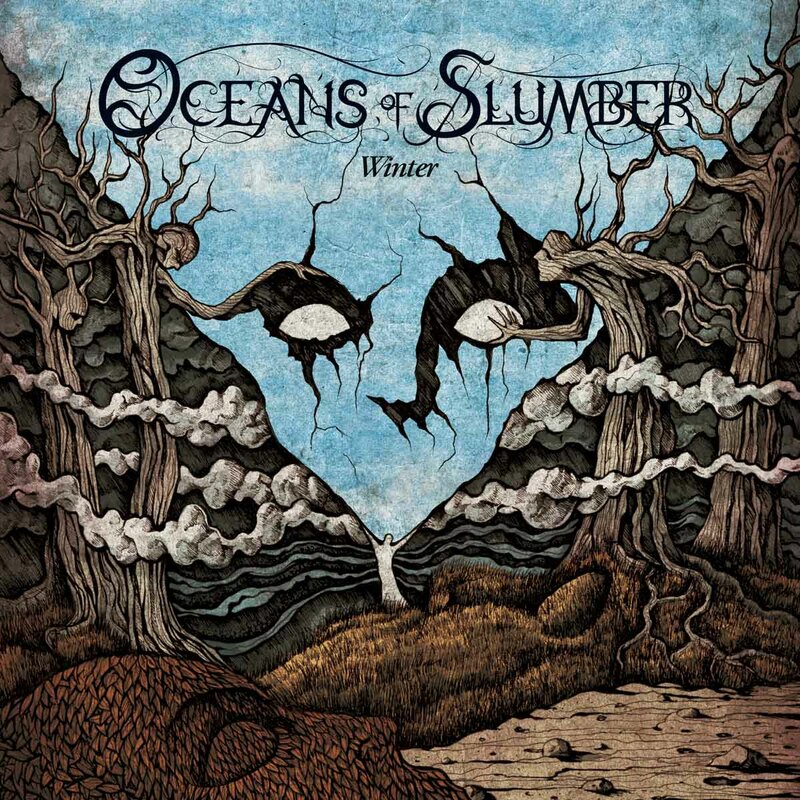 On their new album, Winter, Oceans of Slumber accurately portray their band name, perhaps better than any other group around. Winter is a very peaceful, relaxing album, but much like the ocean, it’s also capable of conjuring up some pretty ferocious storms. The title track is a great example of both elements of the band’s style: haunting but peaceful melodies from vocalist Cammie Gilbert and soothing music that slowly builds intensity until it reaches a fever pitch punctuated by throat-tearing background roars. And as quickly as the storm peaks, it’s gone. “Devout” follows a similar path, blending technical metal flourishes, furious double-kick, and a solo ripped straight from 80s classic metal with dirge-like, sinister vocals. Cammie Gilbert has a lower vocal range than many of her contemporaries in the “female metal vocalist” genre, but uses her contralto as a weapon. Instead of reaching for the heights, her voice slithers through the depths and adds a unique texture to the album, as do the multiple instrumentals, which range from flute-led offerings to mostly electronic horror-movie chiming to a beautiful classical piano outro. Tracks like “Suffer The Last Bridge,” – easily the most radio-friendly song here, adopting a more traditional sound while still playing with an odd song structure – “…This Road”, and the gloriously heavy “Apopologue,” will be familiar to fans of European orchestral metal like Nightwish or Sonata Arctica, but still have a distinctive prog tinge to them. “Apopologue” in particular throws the kitchen sink at the listener, featuring aggressive instruments, bits of spoken-word vocal, intense screaming, and even a blastbeat-thick breakdown. Perhaps the most intriguing track is the band’s stunning cover of “Nights in White Satin.” Right away the song is both recognizable and completely metamorphosed into a new form. Cammie Gilbert‘s sultry vocals are perfect for this song, and the band takes the music into a totally unexpected direction, echoing elements of the ever-popular Jefferson Airplane megahit “White Rabbit” and simultaneously Opeth‘s incredible Blackwater Park album. The end result would sound at home smack dab in the middle of Pink Floyd’s Dark Side of the Moon, at least until the machine-gun drumming kicks in, transforming the song into a sinister hymn reminiscent of recent breakout act Ghost. Placing the song third on the tracklist is also a bold move, going completely against the convention of saving covers for late in the album. While there are moments when Winter seems to stall -“Sunlight,” while showcasing some excellent, soulful vocals, fails to go anywhere, “Turpentine” is almost too sparse to count as a song, and “…This Road” is almost *too* familiar to stand out – there’s always something there to keep your attention, be it a subtle guitar solo, phenomenal off-kilter drumming, or simply unexpected shifts in the direction of a song – the brief flirtation with bossanova in “Turpentine” comes to mind. If you want your music to challenge you, Winter is an excellent choice.